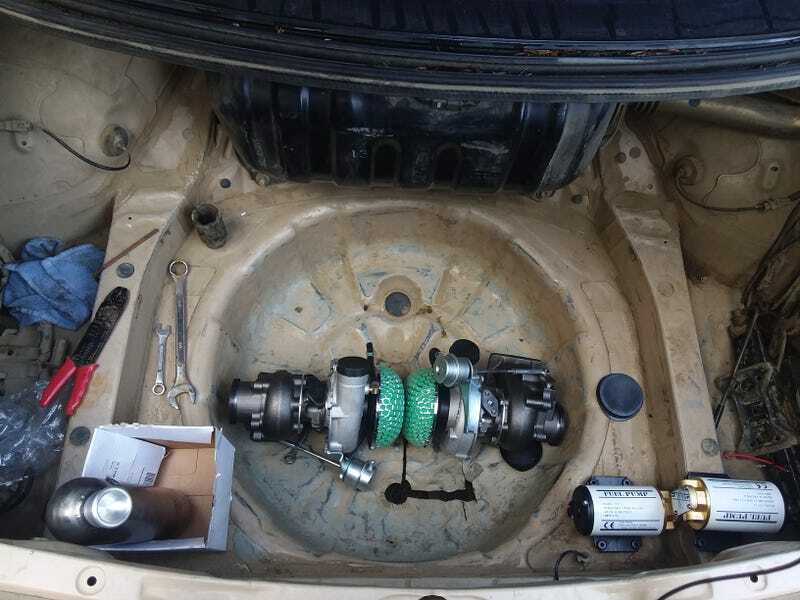 Due to fabrication costs the turbos are going in the trunk. This way I only pay for a normal 2.25" exhaust with an X pipe up two a couple flanges. It will still cost a fortune to have an exhaust from the manifolds back made but its significantly less than modifying stock manifolds AND making a full exhaust. The turbos will have their own oil system seperate from the motor. Those two”fuel pumps” will pump oil from a reservoir into and out of the turbos. The overall horsepower goal to begin with is 300ish at 7psi on a stock ecu and a rising rate fuel regulator. My two main worries right now are if I sized the turbos right and if the oil system will work properly. But overall those are issues i can fix with some trial and error(hence cheapo turbos).